Photo 2：Educators visit the library of Yunnan University. On June 27-28, the “2017 Yunnan-Thailand Education Cooperation Conference”, organized by Yunnan University and sponsored by Royal Thai Consulate General in Kunming and Yunnan Provincial Department of Education, was held in Yunnan University. Thailand is located in the center of Southeast Asia and it is an important country along the “Belt and Road”. As China’s gateway to South and Southeast Asia, Yunnan is adjacent to and culturally connected with Thailand. The Yunnan and Thai peoples are friendly to each other, which makes another advantage in education cooperation. Lin Wenxun, president of Yunnan University, introduced the cooperation between Yunnan University and Thailand to the journalist. He said that the cooperation between Yunnan University and Thailand started pretty early and has been very practical. In the field of talent cultivation, a joint undergraduate program major in Mandarin Chinese international education was launched together with Prince of Songkla University and Xibokang University, and a joint undergraduate program in Thai language was developed with Chiang Mai University and Mahilung University. 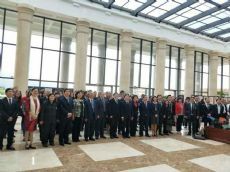 With the constant deepening of the cooperation between Yunnan University and Thai universities and colleges, exchanges between these 2 parties are more frequent. Over 100 Thai students come to Yunnan University to study various subjects at different levels. Ms. Kaewjai Nacaskul, director of the Office of International Affairs and Global Networking, Chulalongkorn University, said that undergraduate students of Yunnan University must take a strict language proficiency test before applying for a master degree program at Chulalongkorn University. In their cooperation, teachers from multiple academic areas will be exchanged to teach, so that they can learn from each other to make mutual improvement. “In recent years, Yunnan’s education cooperation with Thailand has borne abundant fruits. In 2016, Thai students in Yunnan were over 2000 while Yunnan students in Thailand were over 4000,” said Zhou Rong, the head of Yunnan Education Department, when he gave the address at the exchange activity. Now, Thai language study programs have been offered in 28 universities and colleges in Yunnan. 2 Confucius Schools have been established jointly by Yunnan and Thai Universities. The 2+2 joint programs are welcomed by the students. The journalist learned from the exchange activity that since the Thai government officially approved the legalization of Chinese medicine, the popularity of Chinese medicine has been continually increased. Chinese medicine, which has been in China for thousands of years, is a new booming medical science in Thailand. Currently, there are over 200 hospitals in Thailand have Chinese medicine clinics. Because of its significant effect, more and more Thai people like to see a Chinese medicine doctor. The popularity of Chinese medicine has also promoted the study and research of Chinese medicine in Yunnan’s universities and colleges. “Yunnan University of Traditional Chinese Medicine has always been adhering to the subject of Chinese medicine, excavated and developed traditional medicine academic discipline with Yunnan local medical resources, supported the integration and emergence of academic disciplines. Mr. Pornpop Uampidhaya, Royal Thai Consul General in Kunming, said that the 2017 Yunnan -Thailand Education Cooperation exchange activities has set up a good platform for both parties to conduct deeper communication that will upgrade the pragmatic education cooperation and enhance the friendly relationship between the 2 countries for win-win and mutual benefits.